The High Court thus issued a verdict, directing networking sites to remove and stop uploading any false information about Gospel for Asia and our various ministries. In addition, the High Court also had those who posted this misinformation arrested and the material they uploaded removed. Yohannan’s web posting links to two articles in the Indian press (here and here) as evidence for his claims. However, as I pointed out previously, the articles don’t support Yohannan since they do not describe a verdict. 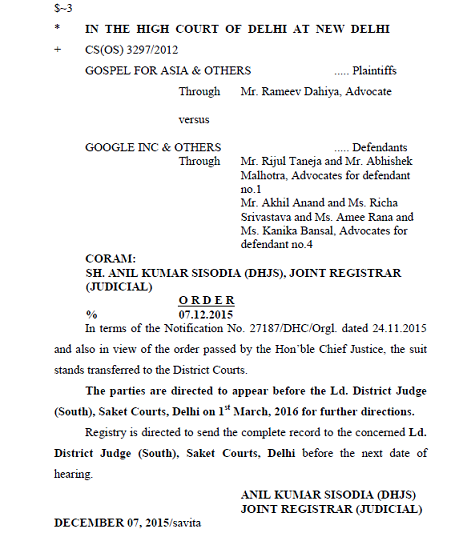 Instead, the press articles report the initiation of a lawsuit against Google, Facebook and many others by Gospel for Asia in India and Believers’ Church. The case has not been, and probably won’t be, heard by the High Court. A source in India told me that the case was sent to District Court (Saket District Court in Delhi) because the amount of damages claimed was too low to trigger the High Court’s involvement. By statute, cases under 2 crore (about $300,000) are sent to a lower court. A search of the High Court record reveals no injunction in the case so it is puzzling that Yohannan would claim a verdict when the case hasn’t been tried. Here is another situation where what GFA says is at odds with information that is publicly available. I call on Yohannan to retract his claims or provide an explanation supported by evidence which can be verified. UPDATE: A reader sent along a December 3, 2012 email sent by GFA (click the link to see the image) with K.P. Yohannan’s article “A New Type of Persecution” article as an update from K.P. Yohannan. It is the same as the article on the website and was touted to donors and mailing list members. Apparently, this “news” was intended to help raise funds. Next Next post: Update of Charity Review of Gospel for Asia Australia; Are GFAA and GFA Related?